Research has found that the genetics of both brain and skull growth influence head size. In research recently published in Nature Communications, scientists from the Max Planck Institute (MPI) for Psycholinguistics (Nijmegen, Netherlands) and the University of Bristol (UK) have shown that the size of a child’s head is related not only to the growth of their skull, but also to the growth of their brain. In a genome-wide analysis study (GWAS) of 46,000 adults and children, the researchers found that the genetic influences on head circumference are correlated with the genetic factors regulating intercranial volume. Each factor remains relatively stable throughout development. “It came as a surprise to us that genetic factors in infancy explain more than 70% of the genetic variance at age 7, and more than 60% at age 15 years. 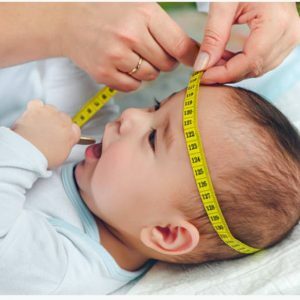 This suggests that our final head circumference is already genetically predicted at a very early age,” explained author Chin Yang Shapland (MPI). Observing head circumference and inter-cranial volume as two measures that share an underlying characteristic, the so-called ‘final cranial dimension’, the team identified 9 associated loci, one of which being a relatively rare genetic variation found in the TP53 gene. TP53 codes for the p53 protein, often named the ‘guardian of the genome’ due to its control over cell division and death. The authors suggest that p53 may be an important protein in the development of the meninges, three membranes that cover the brain found directly under the skull. The dura mater, arachnoid mater and pia mater are layers of tissue that protect and support the central nervous system. During postnatal growth the meninges expand and trigger the production of further skull bone. In the study it was found that those with the variant in the TP53 gene had 0.5cm wider heads in childhood relative to people without the variant. “The genetic associations offer a new perspective on the biological contributions of p53 to brain and skull development,” commented Simon Fisher (MPI). “Our findings show that genome-wide approaches combining genetically and developmentally related phenotypes may enhance the power to identify even relatively rare genetic variation with large effect,” explained co-first author Simon Haworth (University of Bristol). “Using measures of the developing skull as accurate and easily accessible proxy for intracranial volume may enable us to investigate cost-effectively genetic factors that also affect brain growth,” concluded St Pourcain. The team now hope to follow up on their findings and explore the implications that may be had in regard to disorders.